Not long after EW revealed 15 covers for their Avengers: Infinity War-themed issue, they released some new photos from the film! Those photos feature several of our favorite heroes. Six of the images are new, while two others are shots that we've already seen in the trailers. The most epic photo features Thanos pulling a moon from space with the Infinity Gauntlet and is about to smash it into a freakin' planet! This whole scene was actually showed at Comic-Con last year and it was amazing! What do you do with the mad that you feel? If you're Thanos, you use the purple and blue Infinity Stones to rip a moon out of orbit and hurl it against the ground like a dinner plate. While fans have speculated that this may be devastation on Xandar, where the Nova Corps was guarding the purple power stone from the Orb, Marvel tells EW this shot is actually on Titan, the ruined home world of Thanos. It's good to see Don Cheadle's Col. Rhodes up and walking around with some Stark tech and it seems like he's freinds again with Chris Evans' Captain America and Scarlett Johansson's Black Widow. Here we see Tom Holland's Spider-Man springing into action during a class field trip when he spots a strange Q-Ship hovering over New York City. It doesn't look like he has his Iron Spider suit yet. Avengers: Infinity War deals with its massive cast of heroes by breaking them up into teams. This is one of them, with Robert Downey Jr.'s Iron Man, summoned by Doctor Strange (Benedict Cumberbatch) and warrior-librarian Wong (Benedict Wong). Then Mark Ruffalo as Bruce Banner crashes back to Earth just as a strange ship arrives over New York. Fans of Wakandan technology chief Shuri will be happy to know she's a key part of Infinity War, seen here meeting with Elizabeth Olsen's Scarlet Witch and Ruffalo's Bruce Banner. 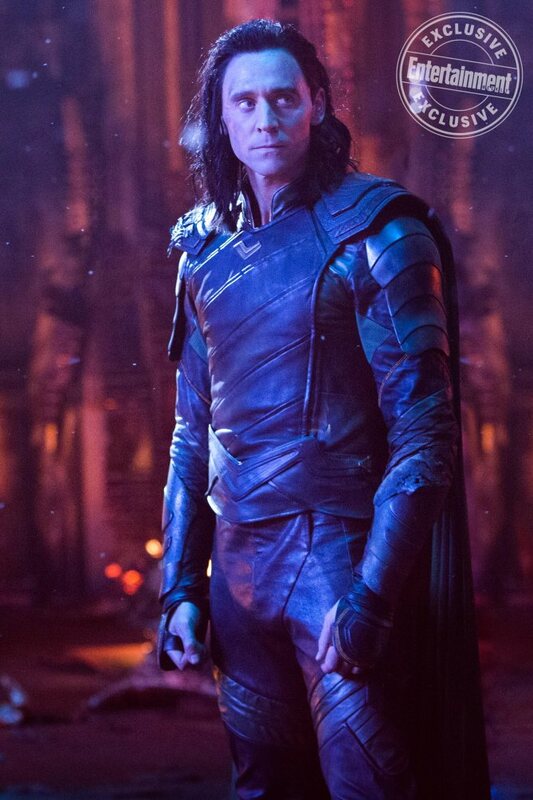 Before the end of Thor: Ragnarok, Tom Hiddleston's Loki managed to pocket the blue Space Stone locked away in Asgard's archive. This is the object Thanos sent him to retrieve in the original Avengers, and he not only failed — he lost the staff that contained the yellow Mind Stone (now giving life to Paul Bettany's Vision). We know Thanos collects the Space Stone early in Infinity War, so Loki has likely settled his account. Partially. I wonder what kind of mission that Gamora is on. Any theories on what you think she's doing? That's Winston Duke's M'Baku, again fighting alongside his king, Chadwick Boseman's T'Challa, with Captain America and Sebastian Stan's Winter Soldier (now known as White Wolf to his Wakandan caregivers) standing at attention among soldiers from the border tribe. Now that Wakanda has opened up to the world, the fantastical nation needs to protect it. The Anthony and Joe Russo-directed film is set to hit theaters on April 27th, 2018.